Just over fifty years after A Man for All Seasons won six Oscars including Best Picture and Best Actor for Paul Scofield, Fred Zinnemann’s adaptation of Robert Bolt’s stage play has found unique points of modern relevance. It is re-released at a time when its more conventional view of Sir Thomas More as hero, supported by the Vatican’s beatification of him, has been challenged by Hilary Mantel’s Wolf Hall, in which Thomas Cromwell, here a scheming figure played by Leo McKern, is the hero and More the villain. Eureka Entertainment also re-release the film amidst a populist political climate. Indeed, its depiction of someone personally opposed to the use of executive powers may find parallels in the public accusations of “traitor” and “enemies of the people” hurled at those who seek to uphold the law. Yet More’s stand is subtly different. In spite of questionable historical accuracy A Man for All Seasons makes a powerful case for the right to abstain, remaining silent and not to suffer the ire of the state. As the aging Cardinal Wolsey (Orson Welles) dies without solving Henry VIII’s proposed divorce of Katherine of Aragon so he can marry Anne Boleyn, the lawyer and scholar More (Scofield) is forced into the spotlight. Someone who had previously only aired his views on the Great Matter personally, he is made Wolsey’s successor as Lord Chancellor and immediately pressed by Henry for his support. Even as More attempts to shed his power, Henry’s quest for power over the Church in England grows further and such an influential figure as himself must voice his support or be labelled treasonous. More, both his duty and the need to protect his family weighing heavily on him, refuses to take either side and that makes him an easy target for conspiring Cromwell and Richard Rich. Not that More holds back when he’s eventually convicted in a sham trial, an angered speech that’s just one of Scofield’s many highlights. 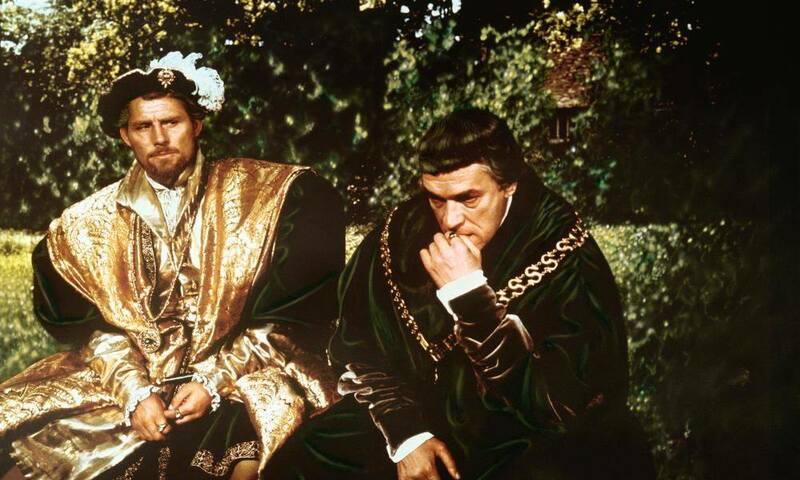 Robert Shaw’s quintessentially dickish Henry VIII, for which Shaw was also Oscar nominated, sidesteps usual depictions of a fat and cantankerous king to show a young athletic man. Loud and belligerent but also insecure, he admits he feels punished for his ‘sin’ of marrying Katherine of Aragon and wants the validation of More’s friendship and consent. Even as he shouts at and cajoles his new Lord Chancellor, he concedes he respects him more than others precisely because the pursuit of power doesn’t drive More’s decisions. If A Man for All Seasons contains any justice, it’s in the new Blu-ray presentation. Ted Moore’s cinematography plus the production and costume design shine like never before, from the intense reds of Wolsey’s chamber to Henry’s extravagant gold cloak.